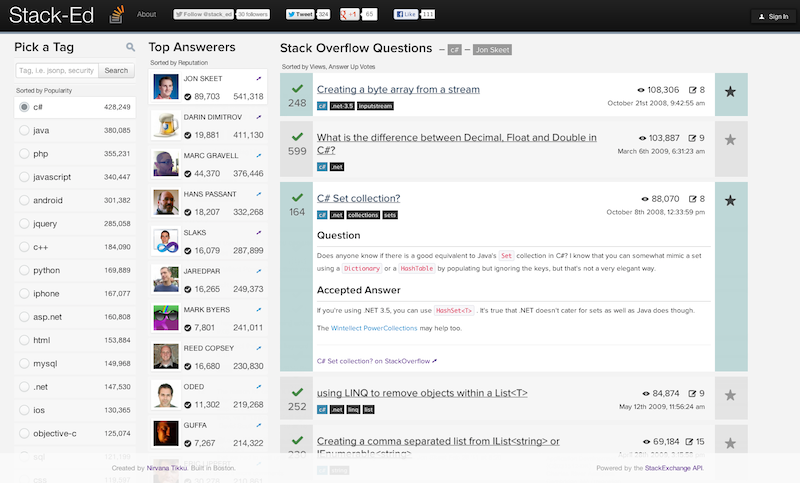 The Stack Exchange platform is changing the way that we learn. Stack-Ed is an educational tool that was built to help people learn from the best of the best within the Stack Exchange communities. Stack-Ed was born out of a desire to peruse the top answerers and their most viewed and voted on answers to questions. The top answerers are often considered experts. They give exceptional care and attention in their answers, and thanks to the Stack Exchange platform, they're validated by the community; they're great to learn from! I couldn't find anything to help me consume this information in a casual manner, so I took a weekend out to hack out the web version and posted it on Hacker News. On launch, the exposure brought a good 18.5K visitors. With the interest and excitement around the web version, I created an iPhone version that has all the same functionality, with the exception of search (coming soon). I have found the experience to be quite engaging, particularly when diving into new topics, or looking to kill some time. The consistent nature of the Stack Exchange API has allowed me to extend Stack-Ed to be powered by any Stack Exchange site. The result of this has been eye-opening; the breadth of topics available at our fingertips is amazing. Stack-Ed is open sourced and I encourage anyone to play with the code; keep in mind it was a weekend hack. The Stack Exchange model has empowered people when learning. As you look to explore new topics (or test your knowledge about ones you consider yourself an expert in), give Stack-Ed a shot. There's something interesting when learning from sought after, qualified answers to various questions. Both the website and the app are free. I really want this to be a useful educational tool, and simply want to empower people with the ability to learn from the great wealth of knowledge across the various Stack Exchange sites. For the web application, I created a custom webapp ontop of Google AppEngine. I used Backbone, Require, Less, Moment and Bootstrap. I use YQL to resolve the content for the question/answer and fallback to Python with BeautifulSoup. I created custom API wrappers to talk to SE. For the iPhone application, I created a native Objective-C iPhone app and pretty much rolled everything myself, with the exception of one library, SDWebImage, which I used to handle async image loading/caching. The iOS code also includes Prettify for code syntax highlighting and MathJax for handling the rending of LaTeX. The iOS code has not been posted on GitHub, but I have been thinking about it. I may do so; depends on interest. Browse other questions tagged app website iphone .